Over the last few days I have been pulling together (with some help from my family) some facts and figures about the use of Facebook and Twitter by UK Fire and Rescure Services. The table below shows figures for 20 authorities for whom I could find an official Facebook page and an official Twitter page (at least pages I think were official). The table shows how many people follow them on Twitter and how many like their Facebook page and the data are ranked by the sum of the two data columns. Although there is clearly a relationship between the two columns, the relationship is less strong/linear than perhaps might have been expected, the product moment correlation coefficient is just over 0.6, which means the two columns share about 40% of their variance. One of the big outliers is South Yorkshire who either have fewer Facebook followers than their Twitter presence would suggest, or have a much stronger Twitter presence than their Facebook numbers woudl suggest. However, one should perhaps not spend to long looking at the relative rankings of the services, but question the overall values. Hampshire has a population of about 1.3 million people, over half of whom are likely to be users of Facebook, to a tally of 8314 users means that about 1 out of every 100 Facebook users in Hampshire likes their page. In Kent, the third highest in the table, the figures are something like 3 in every 1000 Facebook users. Whislt all the services should be praised for starting to tackle the challenge of Facebook and Twitter, and the ones at the top end of the table are clearly doing best of all, there is a need to devise strategies that would see these numbers to rise by a magnitude of 10 or even 100. UK retailer Next has over 500,000 people liking their page, so it ought to be possible to see the best Fire & Rescue services with more than 100,000 people liking them, IMHO. Under UK law, Welsh public sector sites have to be available in both English and Welsh, which is fine for webistes, but what about Facebook? This is a question I have been asked several times over the last few days, having run a webinar on Facebook for the public sector on Thursday and workshops for the Welsh fire services on Friday and South Wales Police on Monday.The question goes right to the heart of what social media means and the loss of power it represents for organisations (be they companies, charities, or public sector). Somebody who runs a Facebook page (e.g. the North Wales Fire and Rescue Service) can post their copy in English, Welsh, or both. However, when people post their comments they will choose which language they want to use. I have been asked whether Facebook can be set up in Welsh? The answer is yes, but because Facebook is a Web 2.0 service, each user can decide what they want their Facebook to be (as shown in image below, using Account/Account Settings/Language). Somebody who wants to create a page can set their Facebook to be in Welsh (or French or a wide range of languages), but this does not affect what the user sees. The user will see Facebook in their chosen language. In Facebook there is a clear demarcation between the language of the application (which is determined by the user) and the language of the posts (which is determined by the page’s owner). So, what should a Wales-based public sector Facebook do? Having spoken to several people, there seems to be a consensus that if about half the posts are in English and about half are in Welsh, that might be OK. However, I would expect to see vocal arguments from people advocating either a) everything should be in both English and Welsh (to avoid Welsh being pushed to one side) or b) everything should be in English (because that is what most people expect on the internet). Which networks are being used for what? What do people think to this table? What's missing? What's wrong? What is the prognosis for market researchers who don't e-network? Are they more productive? Are they using better channels to gain awareness, contacts, promotion? Will there be a two-tier profession in the future - the networked and the not? The BBC report that an Australian couple have been served with a repossession order on their home via their Facebook page. The lawyer trying to repossess their house had tried all the usual avenues, e.g. post, phone, hanging around outside the home, but had been unable to contact them. The message here, beyond the sad news that somebody is losing their home, is that Social Networking is becoming an ever greater part of the 'normal' world. Ben Lorica at O'Reilly Radar has a great post with a really interesting set of data about the continued global growth of Facebook. Quite often we focus on where the leading edge is moving, many of whom have already left Facebook. But we also need to recognise that Facebook is still growing. One interesting tidbit was that Facebook has more members in Canada than it does in the whole of Asia, despite increased growth in Asia. As well as the data, check out the comments at the bottom of Ben's post. There are lots of well informed comments and responses. My latest personal brush with Facebook has been via my 16 year old son who is standing for election for the position of President of the student body at his sixth-form college, he and all the other candidates have created Facebook groups as part of their campaigns, operating as a place for campaign photos, outrageous claims, and spin. I find that I gather some of my best insights about the way social networks are being used by listening to other people’s conversations on the train, particular younger people. Yesterday was one such day. Returning from London to Nottingham a group of five twenty-something women sat near me and starting discussing their day etc. This led to two interesting snippets about Facebook. 1) After a couple of them had been talking about Facebook, one suddenly said “Everyone I know keeps talking about Facebook, I don’t even have a Facebook account!”. The look on the other four’s faces was a mixture of shock and horror! 2) One of the group then started talking about how some of the requests for friends were weird. She recounted a story about an ex-boyfriend. About 4 years ago she had been living with this boy, but had to work away quite a bit. She came back at 5:00am one morning and found him in their bed with some girl she had never met. Not surprisingly, they broke up, the guy married the other girl, and evidently they have had two kids. The person telling the tale signed up to Facebook last October and in December both the ex-boyfriend and his wife (the one in her bed) – both sent Facebook be my friend requests. The others asked what she did. She replied, I said yes, I wanted them to see how well I was doing! Mores about how we communicate and the way we use the term friend seem to be in flux, which certainly has implications for all of those in the insight business. 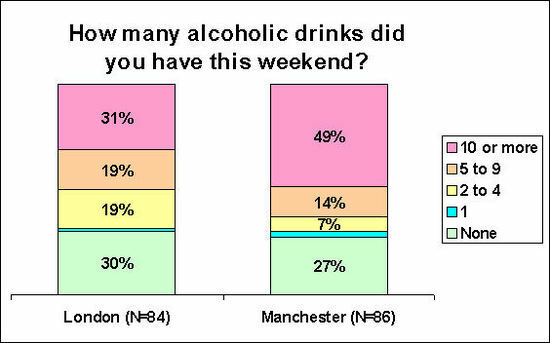 Below is a chart showing the result of a fun poll on FaceBook looking at how many alcoholic drinks people had last weekend. For the full story visit the Virtual Surveys Blog. Increasingly, I am linking my explorations on FaceBook, with my Blog, with articles for magazines such ESOMAR's Research World, and more recently Twitter. If somebody is looking for a definition of Web 3.0, it will be when all of these channels are seamlessly linked. At present I find the most useful FaceBook group as being The Big List of Market Researchers (partly because I am the administrator of it), the group has over 800 members and a reasonably active debate. And, the biggest of all the groups, with over 1200 researchers is I work in Market Research & no I don't stand in the street with a clipboard. BTW, the poll about the meaning of ASAP is still running, to see the latest results go here, and click view results (near the Vote button), if you have not voted, then please add your views. 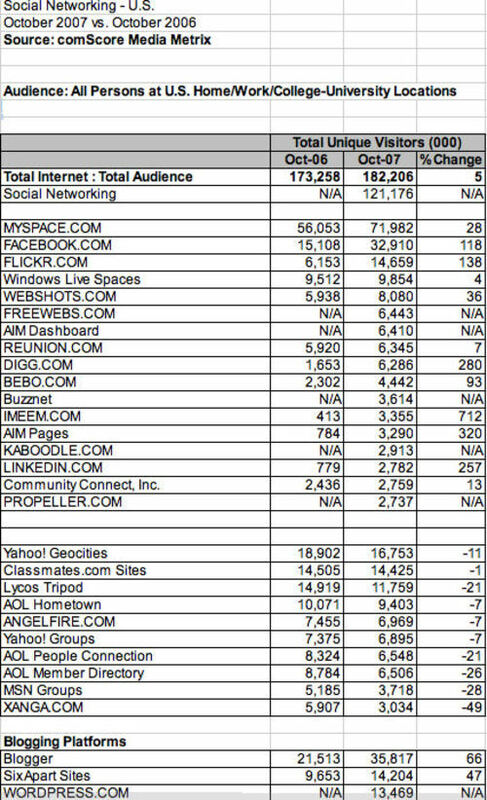 Erick Schonfield has a great post on Techcrunch abou the size and growth of the key social network sites in the US. His table is reproduced below, but please go and read his commentary - at the comments at the bottom of his pot..
3) there are other ways of doing the numbers, and they will give different results.